The title says it all really. Some friends of mine got me an Arduino Pro Micro for my birthday. I’ve been playing around with it for the past couple of days as it differs from most Arduino micro-controllers out there. However tonight I managed to get the LED to blink, which of course is controlled by my Arduino Pro Micro! I threw the circuit together quickly with the LED to ensure that my code and theory was right. I connected the positive leg (anode) to PIN 5 and the negative leg (cathode) to the GND pin. I just used conductive thread as it’s nice and easy to get through the holes, instead of the large alligator clips I have today. Below is an image of how I connected the conductive thread. I also used the Micro USB as the power source, which may be seen as cheating but for the purpose of what I wanted to do I was happy with it. 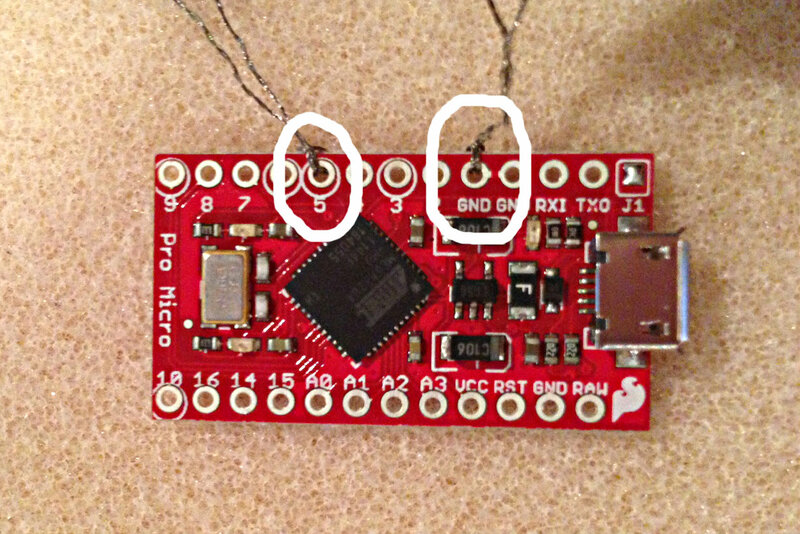 One thing to note with the Arduino Pro Micro is that there is no PIN 13. This PIN number is the usual LED PIN for Arduino chips. I decided that I would use the Digital PIN 5. I moved both my Arduino sketch code and my circuit connection to LED PIN 5. My code is very similar to the example ‘Blinking Light’ selection, the only change is the number of the LED PIN. Later in the week I might explain what I did with my code and what I needed to get everything up and running to this point. Here is a very quick video of my LED flashing, I reload the code with a faster blink during the video.